Roger Hollett’s big league debut will have to wait for another day. 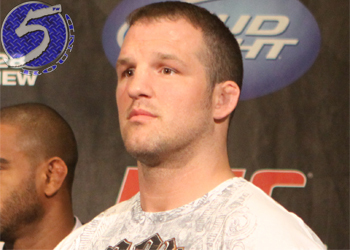 On Monday, it was announced the light heavyweight is out of his UFC 152 scrap against Matt Hamill (Pictured). As we all know full well, the Octagon show waits for no man. Veteran Vladimir Matyushenko has agreed to serve as substitute on September 22nd. It is unknown why Hollett was pulled from the scrap. After a year-long hiatus from the game, Hamill decided to cut his retirement short earlier this month. “The Hammer” called it quits after being violently put down by Alexander Gustafsson last August at UFC 133. Speaking of Gustafsson, Matyushenko was TKO’d by “The Mauler” in his most recent outing. The 41-year-old has been riding the pine since the December defeat.